“Arghaaa!” Noel bellowed, pain exploding through him as he finally came to a stop on the frozen slope. Weakly clinging to the ice by one hand, he lay still, breathing several grateful, agonizing breaths, attempting to stifle the pitiful moans that escaped now and then, though he was sure there was no one around to hear him and his death would be witnessed by no one, save the mountain. The clouds thickened all around him, blinding him to much of his surroundings, as sleet turned to clumps of blowing snow that never quite touched the ground and the world grew darker, but whether this was the result of the storm or the severity of his injuries, he couldn’t be certain until he assessed the damages. For right now he was just happy to lay there in silence, letting the pain course over him, reassuring him he was still alive, though certainly not well. After a long minute, he finally attempted to turn over, but the slippery pitch of the glacier sent him sliding a few more dangerous inches, and he pressed hard against the ice, groaning as he forced himself to a standstill once more, his chest and abdomen burning as bare skin scraped across the frosty ground, his right arm, which had been pinned beneath him in the fall, throbbing. “All right, Noel,” he breathed, trying to calm himself, but as he said the words, the wind blew, churning the air, sending a whirlwind of snow sweeping over him, catching up the tale of his cloak. Noel screamed out in agony as the thick elfin weave snagged on something sharp, whipping it around like sailcloth behind him. The bones of his right calf protruded through his flesh, making a bloody mast for his cloak, where the wind could play, and he felt every sickening tug. Eyes flooded with tears, he looked around for his rucksack, which ripped from his back as he tumbled across the ground. He soon discovered it perched on a precious ledge of rock no more than a foot above him, so Noel clenched his jaw, swearing angrily, spraying a fine red mist across the ice in front of him as he attempted to free his right arm, only to go skidding across the ground again as he swore. His only chance of survival was in that pack. Before Noel left Fendhaim, Foote insisted he take with him a bottle of Iachaol he had managed to procure, in case something happened. Convincing the dark fairies to part with the elixir had undoubtedly cost his friend something much dearer than fortune, though Phileas refused to say exactly what the fairies took from him as payment. Of course, Noel argued he wouldn’t need it, that he had no intention of using it even if he did find himself in want, that it was far too valuable a thing to be given away on a whim, and even proclaimed he would rather die than swallow a single drop, but Phileas shoved the bottle into his hand anyway, and in the interest of saving time, Noel tossed it, haphazard, into the rucksack, as though the gift was a direct assault on his pride. He had trucked that priceless bottle around the world on his back for all those months, never again considering it, and now, the salvation he had tried to refuse rested a bit less than a foot above him, just out of his reach, slipping ever farther away every time he tried to move. There were a thousand simple ways out of this mess, that would all do to be getting on with, if he hadn’t spent most of his energy battling the wind as the storm blew in and a great deal of what remained keeping himself from plunging to his death in whatever craggy hell lurked below. He had to reach that pack somehow, but his options looked rather bleak from his position, so he dug raw, bluing fingers into the ice under his left hand, causing the molecules to vibrate just enough that he could carve himself a decent handhold. He knew he wouldn’t be able to cling to it for long before his left hand became as useless to him as his right one, but that was all he the energy he dared expend on even such a small bit of security, as he rested his battered face against his shoulder, running his tongue over the bloody stumps of three teeth that were no longer there. “Come on, Noel. Think,” he spat, furiously, trying hard not to consider the broken bones, the thin, frozen air in his lungs, all the things that would definitely be the end of him, instead of how he was going to get to the bag to save himself. But his mind raced to question how long he could lie there exposed before hypothermia set in and whether or not he would bleed to death if he sped up his heart rate to stay warm. “Just get the bloody rucksack, and you won’t have to worry about any of that!” he shouted, making a desperate attempt to drag himself up and find some foothold below, so he could free his right arm and make a mad climb for the bag and its slim ledge of safety, but his boot only slipped over the slick ground, and he slid back down, farther than before, his left arm stretching as he clung to that small hold, making his shoulder feel like it would tear under the weight of him. 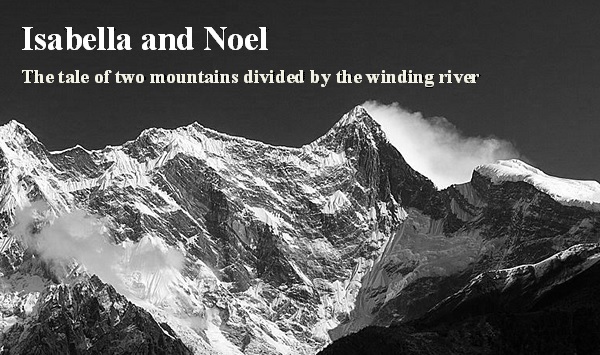 Noel swore an enraged curse at the mountain, kicking his boot at the ice. In answer, a chunk of heavily packed snow fell from somewhere above him, landing square on his head. “Oh, you’ve a sense of humor? Going to bury me in an avalanche for a laugh? Hell, get it over with then!” he yelled, shaking the freezing wet from his head. Then he heard the dangerous grumble of the snow giving way above him, barely audible over the cry of the storm. He looked up in time to see the crevice between the boulders he had fallen through completely disappear as the snow packed into it once again, disguising it for future wayward travelers, as showers of white spilled over the rock-face, dangerously close to where Noel lay, landing with a rain of heavy thuds somewhere beneath him, only to race across the ground until the sound of it was lost in the howling of the wind. His heart hammered in his chest, but the shifting of the snow had given him a dangerous idea, one he could manage with minimal energy and perhaps survive, with a bit of luck. “If I can get to the rucksack to come to me,” he hissed, looking up at the crevice packed with snow, for the first time in his life offering a small prayer in his head to whatever divine power might be out there paying attention. “This is effing insane,” he added, as he tightened his grip on the ice, bracing himself. At first, whatever was happening inside the packed snowdrift was imperceptible, but Noel knew the sound would carry like a quake through the ice, he just had to be prepared for whatever happened as a result and stay ready to spring into action. After a long minute, he heard the crunching of packed ice and snow losing its hold on the glacier. Afraid he had given it too much, Noel uttered an anxious curse as he heard the tell-tale roar begin, off in the distance, somewhere in the blackness of the storm. It wouldn’t affect him, he thought, frustration building as he waited, watching the crevice, hoping the mountain would just let loose its grip on the snow piled above him, just give him enough to knock the pack down from the ledge, but even as he prepared to try again, the snow in the crevice began to fall, rushing toward him, much more of it than he had expected. The tumult hit the bag first, sending it spilling from its ledge, and Noel thrust himself upward, forcing his arm free to catch it even as he was buffeted by the frozen downpour, that sent him sliding sideways, his body grinding against the glacier, hands ripping at the ice as snow rushed over him and he was turned around so he was looking down the slope and could just make out the cliff below in the blowing snow, where everything disappeared, nothing beyond it but a sickening swell of blackness. But only a few feet away from the precipice, the ground began to level and Noel came to a stop, not knowing if he should laugh or cry, his pack hooked in the crook of his right elbow. He carefully forced himself to sitting, broken and battered parts of him working under the strength of sheer will and a hefty dose of adrenaline as he tugged at the opening of the pack, desperate to find the bottle of Iachaol. But the furious thunder of millions of tonnes of ice and snow collapsing grew ever closer. Noel looked up, just for a moment, searching the darkness for his crevice, the path of his escape, if Fate be willing, but all he could make out in the darkness was the bloody trail he had left in his descent, as he felt the wall of snow roaring toward him, reverberating in the air. In a panic, he realized he had slipped right into the path of the incoming avalanche and surely now he would be crushed, so he clutched the rucksack to his chest, furiously attempting to drag himself to safety, but he was too late. From out of the black of night came the gray wall surging toward him, a frozen tidal wave of fury. Noel caught his breath as his body was ripped up from the ground and sucked under the swell that sent him falling down, down, until he slammed against the ground. As the angry torrent of white continued, billowing past him, Noel had just enough awareness of his surroundings to realize he lay mostly still again, as the snow pummeled parts of him until it began to pile up, covering his face, his head, his left leg, and the passage of time became all at once instantaneous and somehow forever, consumed by the wrath of the mountain as it saw to it the elf and his miracle tonic were entombed. Noel awoke to the jarring silence and managed to pull his head free. He woke again, fighting the blackness to keep hold of the pack in his arms. He woke a third time, his body swinging, limp, as he hung upside down, vaguely aware that right before death comes, the whole world reeks of yak’s arse.